Home > Blog > How to open SFMEDIA files? If you received files with an unfamiliar SFMEDIA extension and don't know what to do with them, so our article is written especially for you. This file type was developed by StarForce Technologies to protect video files using the SFContent.com service. You can open SFMEDIA files in the StarForce Player app, which is available for downloading and installing on devices operated under Windows (x86, x64) and macOS. Files of this format are protected videos and audios. Protected means they can’t be played without entering a license key that the publisher provides along with the files. The protection system against unauthorized viewing allows to activate the serial number only on the device where the video was opened for the first time. So, copying, forwarding and other manipulations up to transferring the license key to another user will be unsuccessful. Remember that the video and audio will play only on the device where it was activated, thanks to the system of binding to the device's equipment. First, you need to download and install StarForce Player that is available for Windows and macOS on your device. After installing, the operating system will automatically associate SFMEDIA with StarForce Player, so in the future you will not be faced with any problem while playing such files. Open the received folder with the video and launch it. 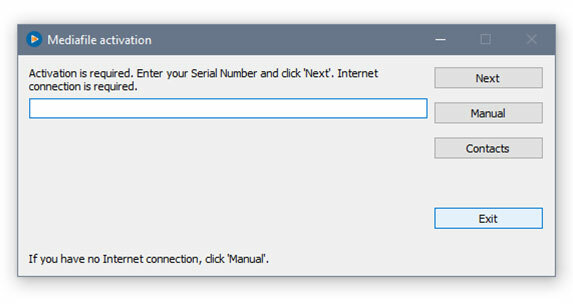 You will see a window where you need to enter a serial number received from the publisher. Activation on Windows: run the sfm3u file. Activation on macOS: run file sfmedia file. In case of difficulties with the protected file activation, we have prepared a useful article for you. After entering the serial number, you can start watching the video or listening to the audio tracks and don't go to any trouble. In addition, in the folder sent to you by the publisher you may find several SFMEDIA files and one SFM3U file. SFM3U is a playlist that was created for the convenience of continuously watching several videos in a row. By launching it, StarForce Player opens the entire playlist at once, so you do not have to open each video separately. As we already mentioned, protected videos and audios with the SFMEDIA extension are created using the SFContent.com website. So, if you need to protect any kind of content (from corporate records to educational courses), this service is ideal for you. SFContent.com will help you limit the sharing of materials without your knowledge, protect against copying, leaking into the Web and hacking. Don't you have a personal account yet? It's time to get it!